Originally based on the book written by Helen Aberson and Harold Pearl, 1941's Dumbo was the fourth animated feature film made by Walt Disney Productions, following up Snow White and the Seven Dwarfs (1937), Pinocchio (1940), and Fantasia (1940). Originally conceived as a short film, Dumbo was reworked as a low-budget feature to help recoup the financial losses of Pinocchio and Fantasia. Made for half the cost of Snow White, the 64-minute film turned a profit, earning $1.6 million during its initial release. In addition to box office success, the film garnered some critical acclaim as well, winning Best Original Score at the 14th Academy Awards. Now, 77 years later, Walt Disney Productions is re-introducing the iconic character to a new generation with a live-action remake directed by Tim Burton (Alice in Wonderland, Frankenweenie). While the original film is told through the eyes of the titular flying elephant, the remake, written by Ehren Kruger, isn't as interested in charming anthropomorphic animal characters like Mrs. Jumbo, Timothy Q. Mouse, and Mr. Stork. Instead, completely uninteresting human characters are central to the narrative. It all begins when Max Medici (Danny DeVito), owner of the struggling Medici Bros. Circus, purchases an expectant mother elephant in hopes her adorable offspring will bring in crowds. The boisterous ringmaster's dreams are dashed, however, when the elephant calf is dismissed as a sideshow freak with oversized ears. 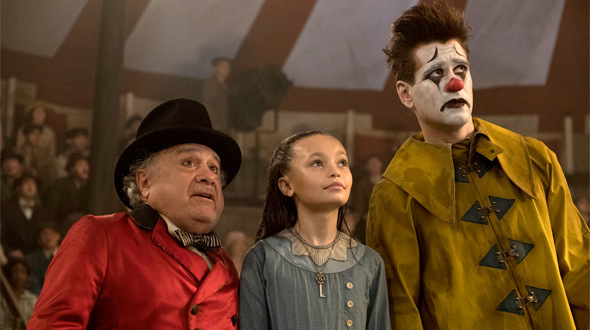 Forced to sell Dumbo's mother to keep the business afloat, Medici enlists circus cowboy and World War I veteran Holt Farrier (Colin Farrell) and his children, Milly (Nico Parker) and Joe (Finley Hobbins), to care for the peculiar pachyderm. When the precocious youths discover that Dumbo can use his massive ears to fly, however, Medici's struggling circus quickly becomes an enormous success, attracting the attention of entrepreneur V.A. Vandevere (Michael Keaton) who recruits the baby elephant for his larger-than-life Coney Island amusement park, Dreamland. 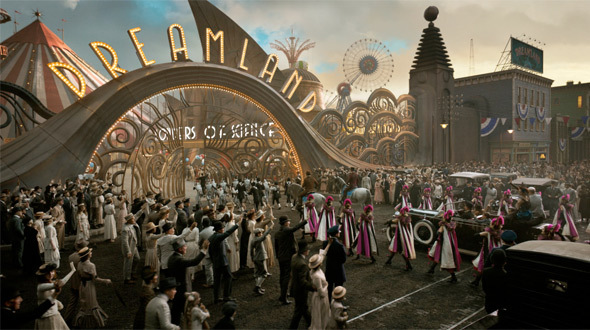 While Dumbo performs alongside aerial artist Colette Marchant (Eva Green of Miss Peregrine's Home for Peculiar Children), the Farriers discover that Dreamland isn't the place where dreams come true. Burton's new take on Dumbo has a few things going for it and a lot working against it. Production designer Rick Heinrichs (Sleepy Hollow, Big Eyes, Dark Shadows, Captain America: The First Avenger, The Last Jedi), as well as costume designer Colleen Atwood (Alice in Wonderland, Blackhat, Fantastic Beasts, Tomb Raider), visual effects supervisor Richard Stammers and cinematographer Ben Davis (Guardians of the Galaxy, Captain Marvel) work together to create a picturesque, yet lived-in storybook environment. Using lighting, color, texture, and shape, these artists convey the warm but run-down and distressed vibe of Medici's circus. Practical sets, props, and special effects come together seamlessly to realize Burton's unique vision – it's just too bad there isn't a better story to go with all the spectacle. Ehren Kruger's career as a writer is an absolute mystery to me. The screenwriter's last well-received film was 2002's The Ring, which he wrote three drafts of before Scott Frank came on to do an uncredited rewrite. Since then, Kruger has written a number of Terrible, Horrible, No Good, Very Bad™ movies like The Ring Two, Blood and Chocolate, Transformers: Revenge of the Fallen, Transformers: Dark of the Moon, Scream 4, Transformers: Age of Extinction, and 2017's Ghost in the Shell. Yikes. His Dumbo script uses human characters to interpret the baby elephant's journey, but his human characters are cardboard cut-outs at best and utterly unlikeable at the worst. Beyond the cute, computer-generated elephant, there isn't a single bit of heart or magic to be found in this movie. And then there's Tim Burton. The legendary director's name is linked to numerous classics like Pee-wee's Big Adventure, Beetlejuice, Batman, Edward Scissorhands, and Ed Wood. Unfortunately, his name is also attached to Planet of the Apes (2001), Alice in Wonderland, and Dark Shadows. Dumbo falls somewhere in between – it isn't the sweet, gently told fairytale that Scissorhands is, nor is it the incoherent mess that Dark Shadows is. With the filmmaker's signature visual flair and a cast featuring frequent collaborators like DeVito, Keaton, and Green, it might look like a Tim Burton film, but it really feels more like a Zack Snyder joint – unrelentingly dark and void of emotion. There are so many downright strange things about this movie, weirder even than Burton's Charlie and the Chocolate Factory. First, there's Colin Farrell's rather questionable Kentucky accent, or the way everyone refers to Dumbo as "Big D." There's Michael Buffer, boxing ring announcer, who shows up as Baritone Bates, a Dreamland hype man who proclaims, "LET'S GET READYYY FOR DUMBOOO!" not once, but twice. Keaton, meanwhile, is playing a deeply disconcerting amalgam of Walt Disney, Emperor Palpatine, and Donald Trump. Like the Just the Ten of Us theme song, DeVito is doin' it the best he can, but it's better to imagine his Always Sunny in Philadelphia character, Frank Reynolds, drunk at the circus. At one point, Wall Street tycoon J. Griffin Remington (Alan Arkin) exclaims, "This is a disaster!" and that just about sums it up here. If you're expecting Burton's Dumbo to compare to Disney's other recent live-action remakes like Cinderella, The Jungle Book, or Beauty and the Beast, prepare to be underwhelmed. Dumbo may have been able to overcome his flaws and soar to new heights, but Kruger and Burton can't get this misguided, entirely empty remake off the ground at all.